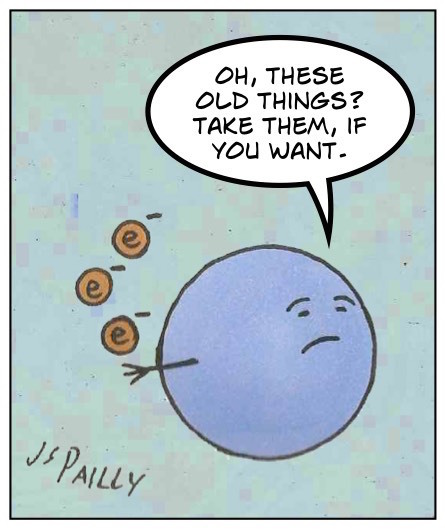 Meet an oxidant: a chemical substance that really wants to obtain more electrons. Also, meet a reductant: a chemical substance that wouldn’t mind losing a few spare electrons. When these two substances combine, the oxidant will oxidize the reductant, and the reductant will reduce the oxidant. Because oxidation and reduction always occur together, the combined reaction is called a redox reaction. But not all redox reactions are created equal. Some are more energetic than others. Just how eager two substances are to oxidize and reduce each other can be quantified in terms of reduction potentials. A high reduction potential indicates that a substance really, really wants to gain electrons. A low reduction potential means a substance would be quite happy to lose some electrons. I won’t go into how chemists determine the reduction potentials of individual substances, but I will point out that reduction potentials are measured in volts. As I currently understand it, the greater the difference between the reduction potentials of two substances, the greater the voltage will be when those substances react. This, I think, is a pretty good hint as to why living cells use redox reactions for their energy production. Within the context of science fiction, understanding redox chemistry and the significance of reduction potentials can help in the imagining of both futuristic technology and extraterrestrial biochemistry. This is my final post on redox reactions, at least for now. I won’t pretend that I fully understand redox reactions, nor will I pretend that I’ve fully explained them in these last few Molecular Mondays posts. But I am convinced more than ever that studying this topic is of immense value for science fiction writers like myself. Posted by J.S. Pailly on May 4, 2015 in Molecular Monday. One thing I’ve been contemplating lately, is how much energy is saved by our dependence on oxygen. In other words, if a life form existed in a vacuum, would its energy requirements be higher? Would there be any benefit for robots in “breathing,” taking in oxygen to help with chemical reactions? I’m struggling with similar questions. I’d think that any organism living in space, where resources of all kinds are scarce, would be under a lot of evolutionary pressure to keep its energy needs low. My understanding is that the few terrestrial organisms that can survive in the vacuum of space do so by going into a state of suspended animation. As for robots, they aren’t necessarily limited to only using naturally occurring chemical substances. I’m still struggling to figure out how to interpret all the conflicting data I’ve found about oxygen’s reduction potential, but it seems there are plenty of other substances with much, much higher reduction potentials than oxygen. It’s just that those other chemicals don’t generally occur in nature on Earth in any substantial quantities (but many can be created industrially). Actually, now that I read that article in your link, it occurs to me that any machine that uses a combustion engine is already taking advantage of oxygen. Combustion and respiration are both redox reactions using oxygen as an oxidizer. That’s a good point. I know part of the tyranny of the rocket equation includes the fact that you have to take your oxidizer with you outside of the atmosphere. Yeah, I guess they would. Unless they’re nuclear powered.